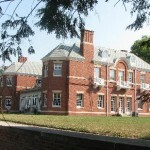 The Robert Allerton Park, with its 1900 Georgian Revival mansion and incredible gardens, are both open to the public. Here visitors may see some ghostly goings-on in the form of a Lady in White, believed to be a guest at the mansion long ago. It is said that she is pictured in some old photos of the mansion guests. Her spirit has been seen walking by the pond and in the guest room where she stayed, where she puts on her hat and gloves. She has also been heard walking on the stairs. I’ve been there a few times and I always had a strange feeling I was being watched when i walked by the house. Ive worked in the allerton house for over a year and have had some unexplainable experiences but have never seen anything paranormal. If there is a haunting its not the kind to be scared of. Its an amazing old home and definitely a place worth visiting. For both the grounds and house! I have stayed here, in what they call the blue room. One night I had laid out a towel and wash cloth on the table next to my bed ready for the next morning. When I woke, the items were gone. I walked into the bathroom and there they were hanging neatly on a hanger.